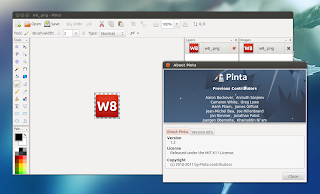 Pinta is a cross-platform, simplified image editor based on Paint.NET, designed to serve as an alternative to more advanced applications like GIMP, for casual users. The application features drawing tools, unlimited layers, includes over 35 image effects and adjustments and can be configured to use a docked interface or multiple windows. There's no Pinta 1.2 official release announcement yet so for a complete list of changes, see the Pinta Github page. The latest Pinta 1.2 in the PPA is only available for Ubuntu 11.10, but until the PPA is updated, you can manually download and install the Pinta 1.2 deb in Ubuntu 12.04 - download it from HERE. For other Linux distributions, download Pinta via GitHub (there are no Pinta 1.2 Windows and Mac builds yet).